I try to be the best I can be every day. I treat people well and I am proud to provide a service that is truly appreciated. Next year, I will have been practicing orthodontics for over 13 years! These past years have been such a blessing, because I have worked with so many children and adults to provide a tangible benefit to their confidence and health. There is nothing better than the reaction when we take off someone’s braces and show them their new smile for the very first time. 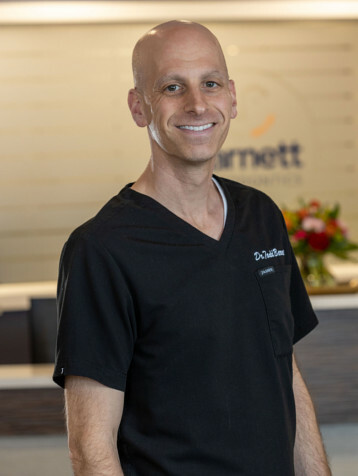 In order to remain the “go-to” orthodontic office, my team and I regularly take continuing education classes locally and nationally to stay up to date on current techniques, treatments, and best practices. At Barnett Orthodontics, we believe that information is power. Originally from Shaker Heights, Ohio, I currently reside in Wadsworth with my wife and college sweetheart, Emily. We have three wonderful daughters: Lilly, Annie, and Ceci. I love spending time with my family and traveling whenever I get the chance. In addition to our work in the office, our practice also volunteers throughout the year to give back to our community. In the past, we have volunteered with the Akron-Canton Regional Foodbank, Summit County Habitat for Humanity. Barberton Community Foundation, and Barberton Mum Fest.